This is a wonderful salad to make if you only need small portions. 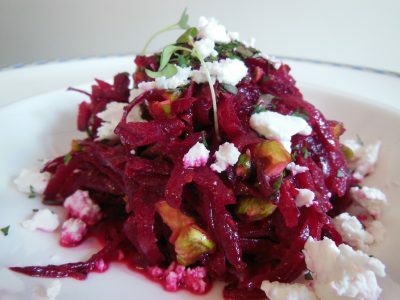 Hand grate the beetroot rather than using a processor - it gives you the real sense of the salad being raw and wholesome. Peel the raw beetroot and grate. Add a crack of the salt. Chop the pistachios roughly and add to the beetroot. Add the zest of the orange, the juice and olive oil into a small recycled jar. Shake to combine. Add to the salad and mix to combine. Transfer to a clean plate or bowl and top with crumbled goats cheese and the herbs.